The University of Tennessee Lady Vols began their 1995-96 season with a modest goal- "seek a wining forture". And that is precisely what they attained, capturing the 1996 NCAA Basketball Championship. 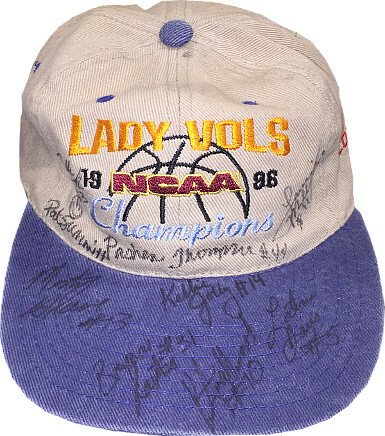 This is a 1995-96 Tennessee Lady Vols 9 Sig NCAA National Champs Cap with Pat Summitt, Michelle Marciniak, Latina Davis, Laurie Milligan, Pashen Thompson, Misty Greene, Kellie Jolly, Kim Smallwood & Brynae Laxton. Beckett Authenticated # A84665 with Full Beckett Letter Of Authentication. Image of actual item instock.